HE’S GOT A VOICE. 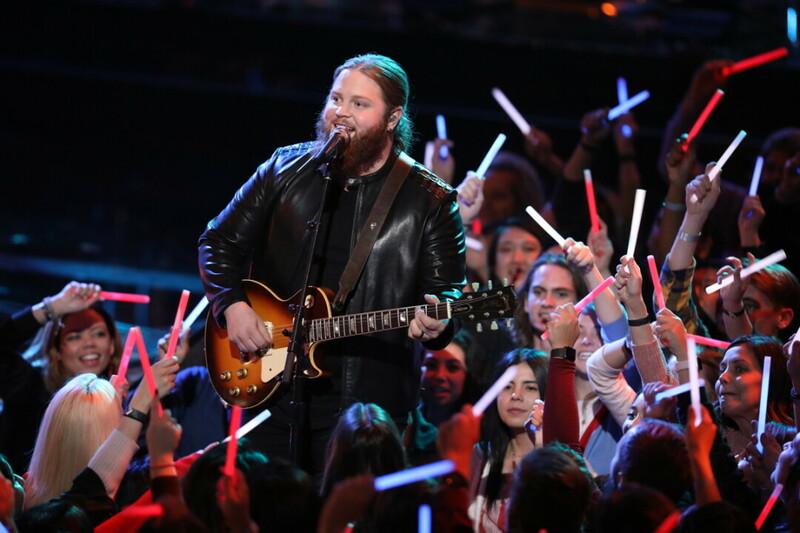 Barron native Chris Kroeze performs on the live finale of NBC’s The Voice on Dec. 17. Barron’s own Chris Kroeze made an impression on the nation that no one will soon forget on the 15th season of The Voice, rising to the top two contestants. Kroeze, who has been a full-time musician for the past seven years, was called and emailed out of the blue and invited to audition for the NBC musical competition. In order to participate in show, Kroeze cancelled 60-plus performances to clear his calendar for two months’ time. Kroeze performed Stevie Ray Vaughn’s “Pride and Joy” for the blind auditions, which caused coaches Jennifer Hudson and country superstar Blake Shelton to turn their chairs to ask him to be on their team. He ultimately chose to work with Shelton, and while on Team Blake, showed his range by singing – and singing well – everything from blues to Southern rock to country, all with his own spin. He also showed amazing guitar skills from his first performance to his last. Kroeze placed second to 16-year-old country singer Chevel Shepherd on the show’s Dec. 18 finale. Kroeze said his favorite part of being on The Voice was “working with Blake one-to-one, getting to know him on a personal level and figuring out how to put stuff together.” He was glad for the chance to gain national exposure while learning to be a better performer. Being on the show made him a better performer by helping him to become more interactive with the crowd and be more of himself on the stage, Kroeze said. However, being away from his wife and children for the better part of six months was an emotional challenge. Kroeze is now back in Barron, the place he calls home, but said he doesn’t mind traveling for work, and that he may be traveling to Nashville to record soon. Notable performances on the show included when Kroeze performed The Beatles’ “Let It Be” and dedicated the performance to Barron. He explained on the show that his hometown had been through a lot with the abduction in October of 13-year-old Jayme Closs, who is still missing. “It was a tough time for the community, Kroeze said, “and I had a big platform I could so something cool on and it felt like the right thing to do.” Kroeze also performed live twice in Barron during the course of the show, for students and at a ceremony for Closs. Local schools, businesses, hospitals, and households showed their support for Kroeze by organizing “Chris Kroeze” days, dressing up as the rising contestant by wearing long hair, fake beards, backwards ball caps, and flannel shirts. Fliers decorated notice boards all over the Chippewa Valley announcing viewing parties and encouraging people to vote for Kroeze to keep him in the show. Kroeze said he saw things online, and heard about it from family and close friends, but not having experienced “Chris Kroeze” days firsthand makes it hard to grasp. Kroeze is performing at the Barron Area Community Center on Feb. 22, at Aquafest in Rice Lake on June 6, is slated to be part of the Country Jam 2019 lineup in Eau Claire July 18-20 and is performing at several other regional events in the next several months. There will no doubt be a lot more to look forward to from Chris Kroeze! To learn more, download songs, or to find out where to see Chris Kroeze play, check out chriskroezemusic.com.